Reputedly "Cathy's place at Bethell's [Beach]" "Hammock and Bach" was Tony Ogle's last print of 2010. As with all of Ogle's fine art prints "Hammock and Bach" began as a detailed painting on board from which each individual colour is then hand separated. These separations became the stencils on the screens through which each colour is printed (some Ogle prints have up to 25 individually printed colours). The printing process involves a careful alignment and registration and constant checking for quality problems. The colours of all Tony's prints are hand-mixed and give the image a very real handmade feel and quality. Hammock and Bach is an edition of 200. (NB for readers outside of NZ "bach" is the coloquial New Zealand expression for a holiday home). Tony's first print of 2011 is "Caravan Window". 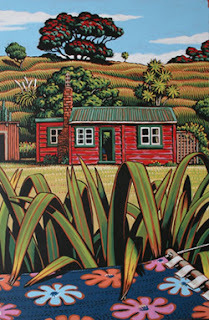 Here the kiwiana style beachside scene is cleverly framed by an oval window that echoes the shape of the caravan windows in the foreground. A tyre rope swing hangs from the branches of the pohutukawa tree. Edition of 180, image dimensions 450 x 180mm. Tony subscribes to single edition productions only, he says "a true Limited Edition Fine Art Print [should be] limited to one edition, each being numbered and signed individually by the Artist. Once the Edition has sold out it should not be repeated otherwise the value of the works is compromised." In the long term this is what gives the artworks value over time.